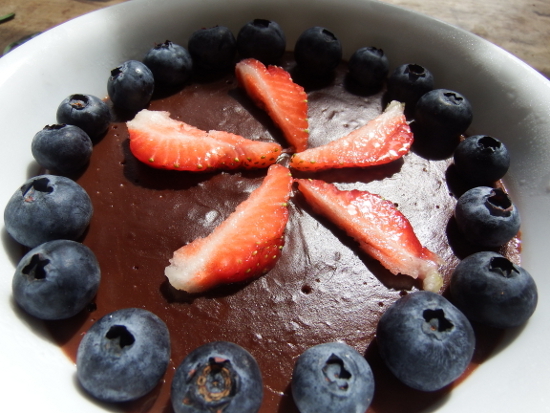 One of my favorite ways to use up milk is by turning it into chocolate pudding. This fast and easy dessert tastes decadent when boiled up from homegrown goat milk, and it would taste pretty good using whole milk from the store too. For the easiest pudding with no risk of scorching, you'll want to make this dish in a double boiler. However, if you're lazy like me, it works nearly as well if you cook the ingredients directly over medium heat while stirring constantly. Regardless of your risk-taking level, it's simple to make this pudding. Mix up the milk, honey, cocoa, corn starch, and salt, then stir until the pudding just barely comes to a boil. Turn off the heat and continue to stir as the pudding thickens, then add the vanilla at the end. Spoon into bowls and cool thoroughly. Garnish with berries if you want, or simply dig into the delicious dessert plain. Serves four. I bet I wouldn't be able to resist eating the whole thing at one time. Jake --- I know what you mean! That's why I dish it into bowls before it cools. That way, Mark will know if I eat half of his bowl before supper. Keeps me honest.